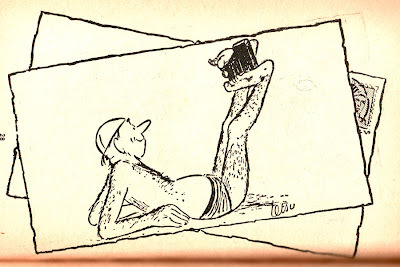 I didn't know Roger (alternately rederenced as Robert) Testu, a French cartoonist who passed away last week. 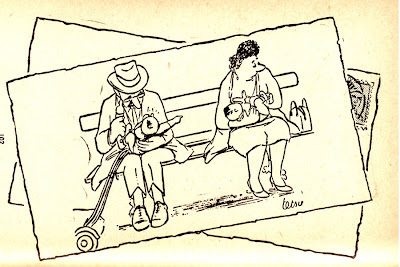 But as soon as I saw "Tetsu," at Tom Spurgeon's Comics Reporter obituary, I knew his cartoon work. In the corner of most all of his cartoons, was a neat, cursive "Tetsu" signature. 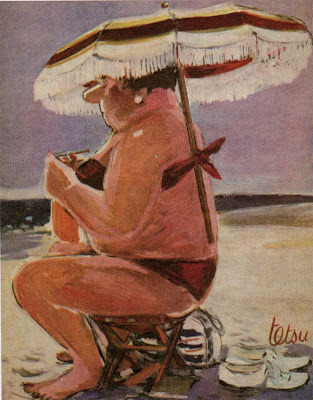 Born in Bourges, a year before the start of the Great War, Robert (some sources say "Roger") Tetsu was a painter until the 1950s, when he began to cartoon. 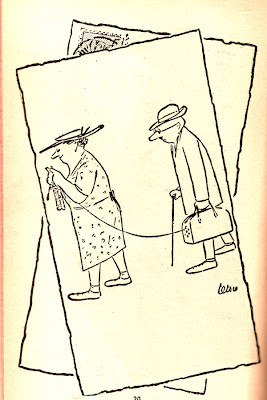 I have less than a dozen of his cartoons, but I remember his distinctive treatment of form and posture. 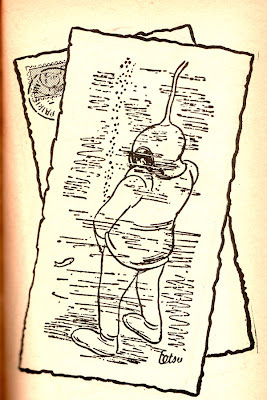 The stance in the above cartoon is just right to convey what our deep sea diver is up to. 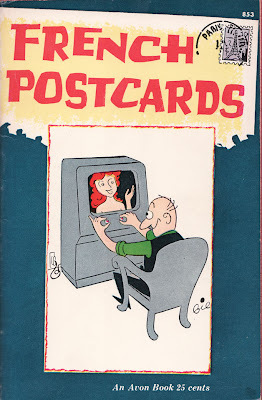 It's touches like this, combined with his depiction of "saucy antics ... from the country that made you-know-what famous" (that's actual back cover copy from this paperback book) that made Tetsu a cartoonist who sold well. Hats add so much to a drawing. I wish people wore more hats. 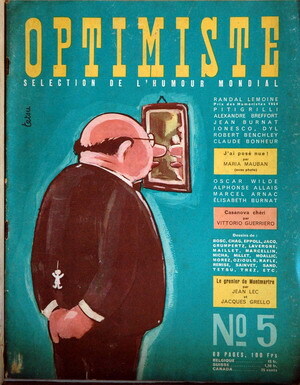 His cartoon work appeared in Paris Match, and Sunday Here Paris. 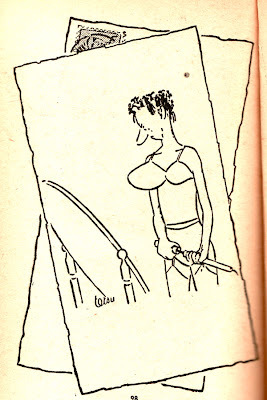 This meant that his cartoons were coming into the average 1950s Parisian home every week. 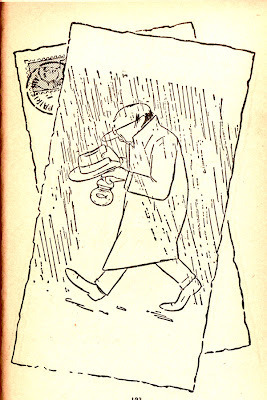 The put-upon slouch of the goldfish-buyer adds to the gag. 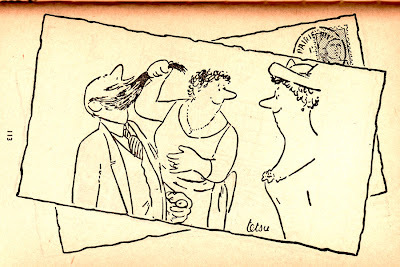 What surprises me personally is that I know his work from just a handful of his cartoons from an obscure American paperback. I wish I had some more to share. A big tip of the hat to Dirk Deppey's Journalista!, where I first heard of Tetsu's passing. And Dirk further lets us know that "his work was also compiled in at least two cartoon albums, La Vie est Belle and La Vie à Deux." Thanks, Mike. I remember his stuff. Always brilliant. Wow! These cartoons are beautiful. You're right about the form and posture of the figures. The gestures of the drawings are brilliant. I would love to see more of his work. I think the main nice thing about this here Mike Lynch Cartoons blog is that occasionally I can shine a small spotlight on someone who deserves more attention. I'd love to see some of his books. Hello Mike. I saw you were the first to post an article on the great Tetsu,so I linked from our blog to yours. It's a fine tribute to Tetsu, who deserves to be known by all cartoon lovers. 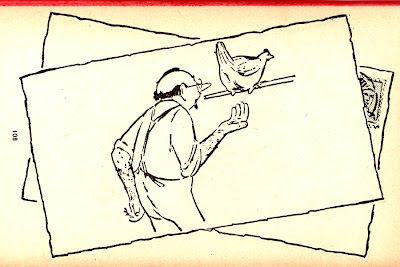 Visit ECC Cartoonbooksclub to view some additional information. Wow! Just some great stuff, and a nice sense of humor too. Loved that goldfish one! Happy 96th Birthday, Creig Flessel!